1. Make sure this is the correct cut to make. 2. Cut up from the underside of the branch, between one-fourth and one-third the diameter of the branch. This keeps the limb from tearing bark off the tree as it falls. 3. Cut all the way through the branch just above (farther away from the trunk) the first cut. 4. Make the finishing cut just outside the branch collar which is a swelling at the base of the branch. If you cut into the collar, you are removing the tissue the tree uses to seal off the wound. There are many chores to do in early spring to get the garden ready for a new growing season. Pruning is one of the most important tasks that should be done early, according to certified arborist Tim Kohlhauff. “The dormant season – from late October through March – is the best time to prune for everything except spring-blooming plants which should be pruned after they bloom,” Kohlhauff says. The worst times to prune are when the leaves start emerging in the spring and in late summer because this encourages new growth at the wrong time. In addition to being an assistant landscaper for the Spokane Country Club, Kohlhauff is a Master Gardener, the plant clinic coordinator for Spokane County Extension and has degrees in nursery and landscape management. With all of that experience, he understands well what pruning does for our landscapes. “Pruning done the right way helps establish good structure, which is especially important for larger trees,” he says. “Pruning can also remove or reduce a hazard. One of the trickiest aspects of pruning flowering shrubs is understanding when it’s safe to give them a trim. It depends on when the shrubs bloom, Kohlhauff says. “If the shrub is spring-blooming – this includes lilacs, forsythia, Oregon grape and shrubby cherries – then it blooms on growth from last year. This means you should prune soon after it finishes flowering in late spring or summer,” he explains. Some of the most common mistakes he sees in pruning include taking too much live canopy at one pruning (such as removing more than 20 percent of a young or weak tree, or more than 25 percent of an established tree), not doing any pruning at all, and excessive pruning to make up for planting a tree or shrub in the wrong place. Kohlhauff’s favorite pruning tools are a hand saw and bypass pruners. He keeps them sharp and clean. “I avoid anvil pruners because they crush the stems as they cut,” he says. “Loppers tend to rip the bark so I use a small hand saw for those situations. One area that can be confusing for gardeners and homeowners is when to prune new trees, including young fruit trees. After that, these simple rules will help you decide where to start making the cuts. Remove all dead wood first, then any branches that are broken, damaged or diseased. If you see any branches that are rubbing on each other or are crossed, remove those as well. Kohlhauff advises trimming off any suckers since they take water and nutrients away from the main stem of the plant. Now it’s time to take a good look at the structure of the plant. The better job you do now to establish a good structure, the fewer problems there will be to deal with later. 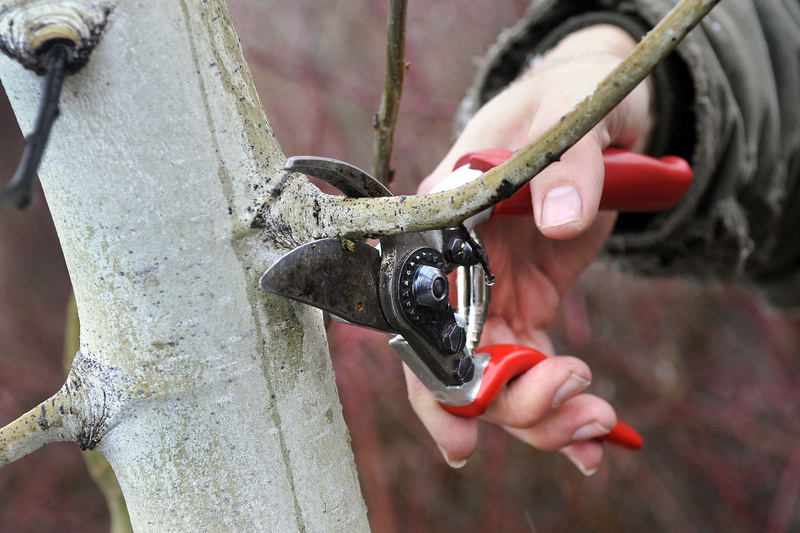 Last but not least, prune any branches that are next to structures or leaning across pathways. Most importantly, don’t hesitate to call in the pros for more complicated pruning jobs. “Any time you have a pruning job you’re not confident you can do well, considering hiring a certified arborist,” Kohlhauff advises. Susan Mulvihill can be reached via e-mail at inthegarden@live.com. Visit her blog at susansinthegarden.blogspot.com for more gardening tips and information.